Cadan, a demonic reaper, comes to her with information about Bastian’s new plan to destroy Ellie’s soul and use an ancient relic to wake all the souls of the damned and unleash them upon humanity. As she fights to stay ahead of Bastian’s schemes, the revelations about those closest to her awaken a dark power within Ellie that threatens to destroy everything—including herself. My very first review on our blog was Angelfire last year so it somehow seems fitting that really close to our1 year blogaversary that I review the sequel in the series! I look back on that review with fond memories it wasn’t the best review I’ve ever written but hey I was just starting out if you want to read it I’ll post a link after my Wings of The Wicked review. On to the review. 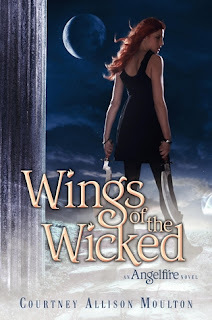 Wings of The Wicked is a crazy ride! Ellie is coming in to more of her gifts (or powers) and along with that her memories are also returning she now knows more than ever why it is that her and Will belong together. That being said it isn’t easy and Will pushes her away even though it tortures him, she’s an archangel after all he thinks he can’t be with her. The funny part is I wrote in my first review that there wasn’t a love triangle well I’d still say it’s not but, there is another character that is sure as hell trying to make it one and for that I love him. Cadan has easily become my favorite boy in the series not that I don’t like Will but he seems too stiff for my tastes. Cadan is funny, passionate, and doesn’t put up with crap from anyone including Ellie. The story continues with so much action that you’re sitting on the edge of your seat as soon as you open the book! Bastian is back along with some horrifying reapers and some very big surprises. I’m pretty sure I said “Oh Crap” a few times and also cried. Answers will be answered but more questions arise. Some pretty terrible stuff happens in this book and the ending will leave you shaking your fist at Miss Moulton because it’s one hell of a cliffhanger! This is a must buy if you loved Angelfire and if you haven’t read it buy them both!!! I decide to use a scene from the book this time. It’s not spoilery since I mentioned Cadan above ;) I absolutely loved this part! That’s one of his sweeter moments but there’s plenty of the smart sarcastic Cadan we know and love in there too! Wings of The Wicked comes out on February 1st so make sure to pick up your copy. Pre-order at Amazon, Barnes & Noble, or the Book Depository. Eeep, awesome review! Man, this book has a special place in me heart. :) LOVE it like crazy! I'm part of an ARC tour for this book and I can't wait till it finally gets to me. I was like 3rd, but she didn't make the list correctly and I moved down to like the 7th or 8th person to receive the book :( I hope it gets here within the next few weeks so I can finally read it. Jaime, if you feel the need AT ALL to let me borrow this I'll love you FOR-EV-UAH! Angelfire was one of my favorite reads this year & I can't wait to see where #2 goes! Great review. I loved this one as well and I like Cadan a bit more than Will too. The ending really made me mad though. I can't wait for the third book!